Also shared: Update on Apple fast lane partnership and collaborative vision for healthcare of the future. This morning's Cisco Live keynote-in-the-round drove home the networking giant's message, rolled out last week, of a "new network for a new era" -- one that's intuitive, powered by intent, with deeply-integrated security. "This year," CEO Chuck Robbins pronounced, "we're beginning a journey to change everything." Getting to this point has meant rewriting 25 years of the company's network infrastructure software running on IOS (Cisco's network operating system, not to be confused with Apple iOS, below). The effort, a huge undertaking, has been completed, enabling the launch of DNA Center, Robbins said. This is the centralized command center for the new Cisco network architecture, as Zeus Kerravala, principal of ZK Research, noted in last week's post, "Why Cisco's Intent-Based Networking Matters." It's where a company will declare intent, which becomes policy that's implemented across the network automatically. And it's a "major analytics platform" that will deliver insight and threat intelligence, Robbins said. 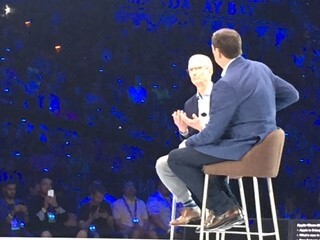 Apple CEO Tim Cook and Cisco CEO Chuck Robbins chat during Cisco Live keynote. With Cisco at a turning point in its core networking business, little wonder that collaboration was not a highlight during the keynote -- though Apple CEO Tim Cook did join Robbins on stage for an update on the companies' "fast lane" initiative. That partnership gives priority on Cisco networks to Spark and WebEx application traffic running on iOS (Apple's mobile operating system) and, as of earlier this month, macOS, devices (read related post, "Cisco-Apple: Extending Life in the Fast Lane"). The fast lane news for today is development of a security app for iPhone and iPad use in the enterprise. The Cisco Security Connector is intended to provide a granular view of what's happening on enterprise-owned iOS devices, and to allow businesses to meet risk and compliance requirements -- "and ultimately expand iOS adoption in new ways," as David Ulevitch, Cisco Security VP, wrote in a corresponding blog post. Cisco will be launching a beta program for Security Connector shortly, Ulevitch wrote. General availability is expected this fall. As Robbins concluded: "Today the story exists on paper. Together we can make it a reality."